Today I made up my own scenic drive while traveling over 350 miles in a round about way toward home. 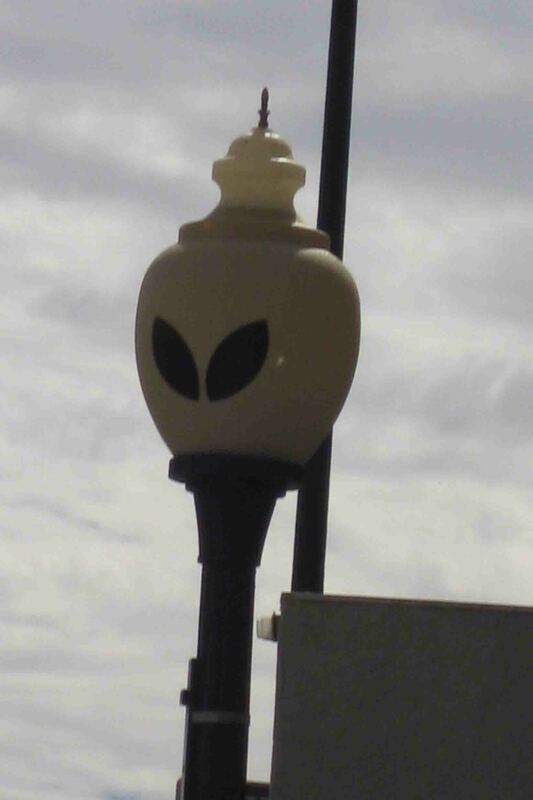 My first stop was Roswell, NM. I had planned to visit the UFO museum; however, after visiting www.tripadvisor.com, most visitors were disappointed because the museum only exhibited pictures and newspaper articles of the 1947 incident. On the other hand, everyone seemed to love the Alien Zone, so I decided I’d read about the 1947 “alien sighting” on Wikipedia and visit this store full of alien merchandise and displays. I did my best to embrace the alien spirit like the town does, complete with alien light posts, but the Alien Zone just didn’t do it for me. 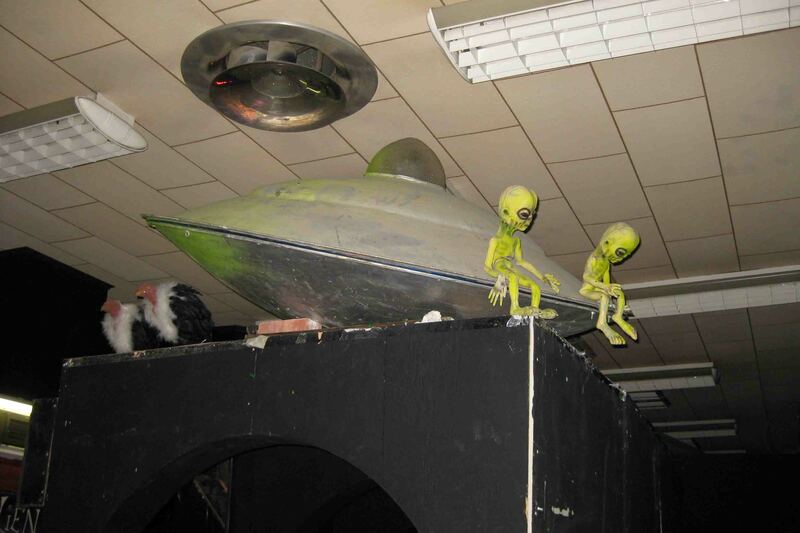 Trip Advisor reviewers claimed the T-shirts were cheap and encouraged bringing a camera and spending $3 to take pictures in all the alien displays. I was able to find $7 worth of crap for my nieces and nephews, and then ducked into the room full of alien displays labeled: Biological Analysis, Physical Analysis, Educational Analysis, Alcoholic Analysis, and the like. Perhaps it would have been more fun with children alongside, after several adult beverages, or during alien convention week. I found the Alien Zone completely ridiculous, but took the reviewers’ advice and snapped a few photos. I particularly liked the aliens sitting on their space ship next to the vultures. 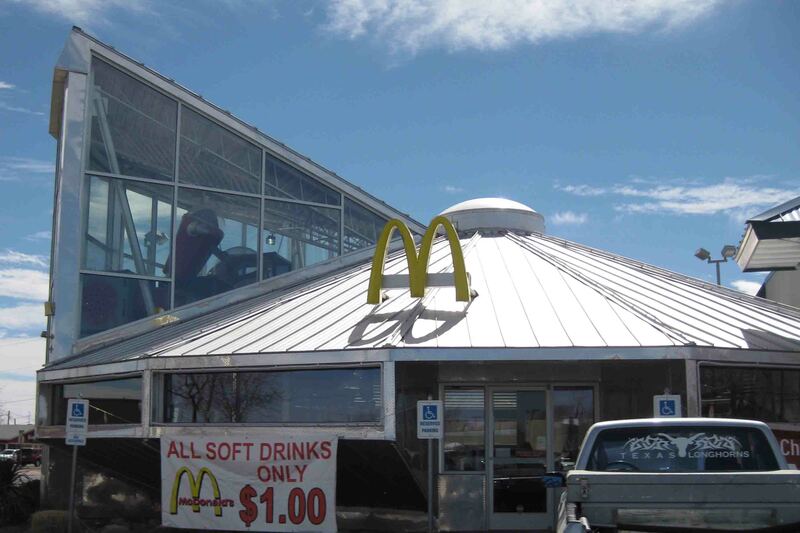 My visit to Roswell would not have been complete without driving through the space ship shaped McDonald’s for an unhealthy lunch! Petey and I continued on to Carlsbad Caverns where giant signs stating “Unattended Pets in Vehicle is Prohibited”. Use Kennels. I started walking him toward the kennels (which he hates), when I remembered he didn’t have his Bordatella shot. Crap. Frankly, it wasn’t hot outside, the sky was overcast, VANilla has shades for every window, two windows are screened and can slide open, the second battery supports a small fan, and a full water bowl was on the floor. I decided Petey would be better off in the van, but was a bit concerned with what everyone else decided to think. 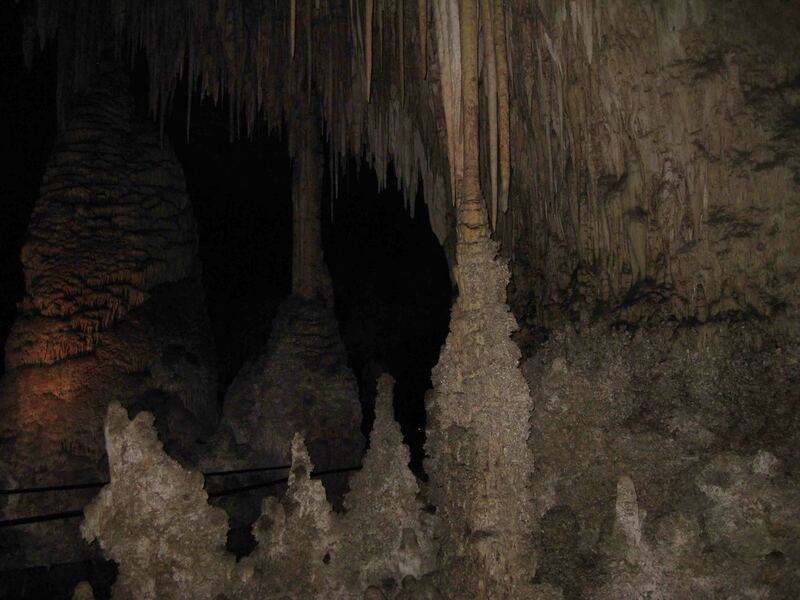 As such, I’m certain I took the world’s fastest tour of the Carlsbad Caverns. The caverns are 750 feet below the surface and have more than a mile of pathway winding through them. I wish I could have spent more time at the park, but faced several time pressures. I arrived about 15 minutes prior to the last entry into the cave and had to make it to the “Big Room” on the tour prior to 3:30 or I would have been forced to take the shortcut. As mentioned above, Petey impatiently waited for me in VANilla. I had two more hours of driving to make it to my campgrounds for the night and was losing an hour as I was traveling east. I feel fortunate that I had recently taken two guided tours of caves in the last few months, so I generally knew all the different types of formations. 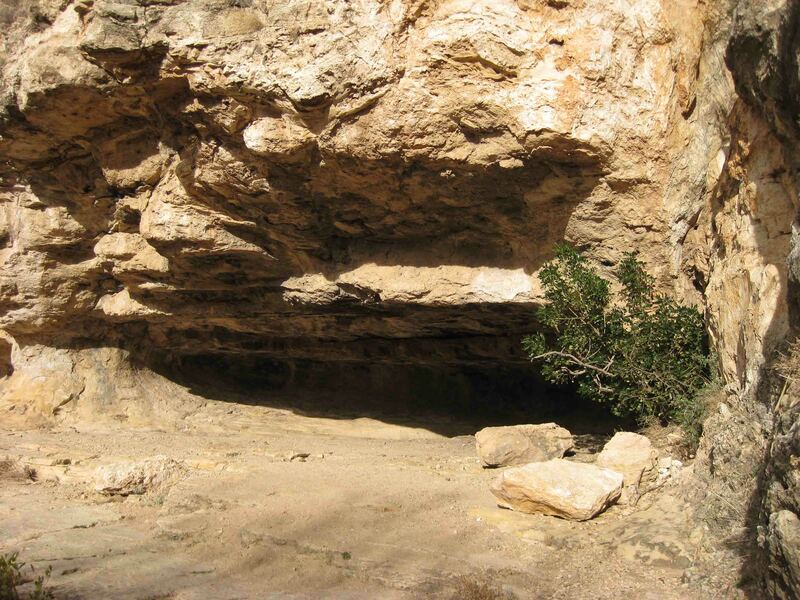 In fact, one nice thing about Carlsbad Caverns is that a self-guided tour is permissible, thus visitors can admire the cave at their own pace. An audio tour as well as a ranger guided tour are also options. I only brought my point and shoot camera into the cave. Due to the poor lighting, my pictures are pitiful to say the least. Oh well, another reason to come back sometime. After touring the underground of the park, Petey and I took a few walks on nearby trails. We passed by a rock shelter previously used by the Mescalero Apache as well as prehistoric people. 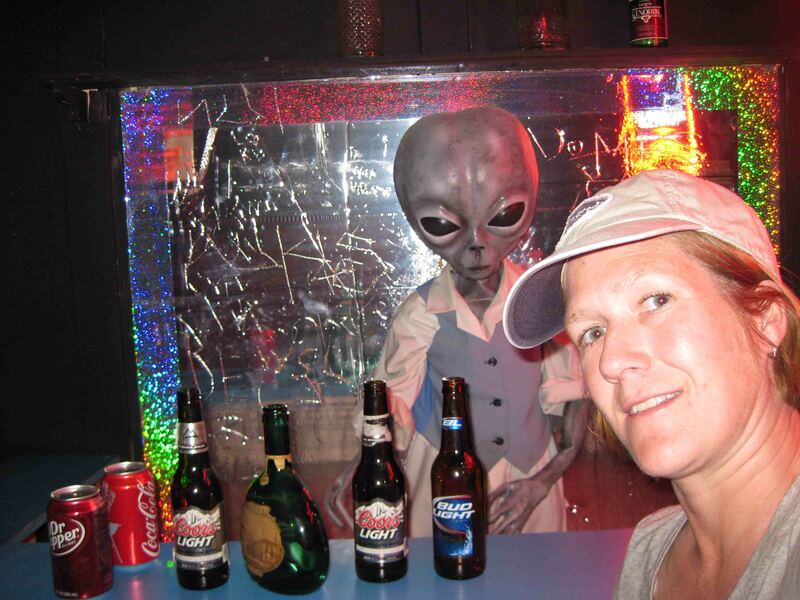 I’m not much of an alien “person” so I was chuckling while reading your blog today. I did get a kick out of the space ship shaped McDonalds though. What a riot! Looking forward to hearing about the fish after you snorkel.